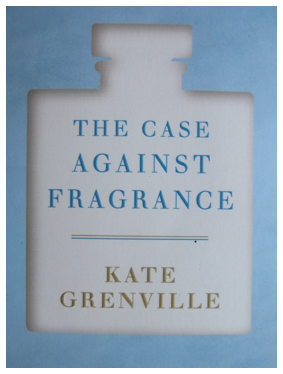 A famous Australian novelist gets sick from fragrances and decides to investigate what is really in these products and what science knows about the health effects. Kate Grenville is a famous novelist in Australia. On a book tour in 2015 she realizes that the many fragrances she was exposed to gave her headaches. In one hotel the hallway was so strongly perfumed she had to tape up the cracks around the door to keep the fumes out of her room. Her publicist had to ensure Grenville got fragrance-free rooms from then on and sometimes sped her through fragranced hotel lobbies. She visits two doctors, who to her surprise tell her fragrances are a problem for many people. She had expected them to tell her it was some sort of psychological problem. She wonders why she�s never heard about this before, and finds no books about it that weren�t blatantly biased one way or the other, so she decided to write her own, and base it solely on scientific studies published in scholarly journals. Her aim was to give her readers enough reliable information to make their own informed choices. Being an accomplished author she is able to make an interesting and engaging book on a topic that could easily be tedious, preachy or shrill. This is the kind of book that is factual, with lots of scientific references, but won�t put you to sleep. She looks into all aspects of fragrance use, including why they are now used so much — it is much cheaper to make shampoos, soaps and other products using nasty chemicals, but they would be unsellable if there was no fragrance to overpower the nasty chemical stench. Several chemicals used in fragrances are known to cause cancer and mess up the hormones in humans. Some of them, such as musk, are found in women�s breast milk and in the blood of newborn babies. The industry is very secretive about its ingredients, but scientists have analyzed many of them in their labs. They have also analyzed the air in offices and other places where fragrances are used, especially in buildings where a lot of people complain about poor air quality. There can be hundreds of chemicals in a single fragrance, such as synthetic versions of natural aromas, synthetic scents that have no natural counterpart and a variety of solvents, preservatives, artificial colors, color stabilizers, UV blockers, etc. When people bathe they are washed off, and pass right through the sewage treatment plant and into the ocean where they accumulate in the fish we eat. They do not break down in nature. To Grenville�s horror, she discovers that the fragrance industry is basically free to do as it pleases, without any real government oversight in Australia or elsewhere. They can essentially put anything they want into their little bottles, and it is rare that the industry decides a chemical is too toxic to use. So the fragrance industry has to find a way to reconcile two opposing facts: the health risks of some of its ingredients, and the impossibility of not using them. She discovers the interesting way the industry decides how much of these toxic chemicals they consider safe to use in each product, while strongly opposing giving the consumers the information they need to make informed choices. Kate Grenville does not have full-blown chemical sensitivity (MCS), so she does not have to make the major lifestyle changes that often requires. The problem appears to be just fragrances — at least for now. Some people start with fragrance sensitivities and progress into full MCS years later if they are not careful. Books with MCS stories are often so far removed from �normal� life that they are offputting — people can only accept so much at a time. Grenville�s book is much more relatable, as she generally just talks about her own headaches and quotes various surveys showing that about a third of the population are affected as well. This should make the book easier to accept for people who are struggling with just the idea that fragrances are unhealthy, let alone make some people sick.
. . . everyone puts up with it, thinking they�re the only one.
. . . the only way to avoid it is to become — to put it mildly — eccentric. The book is globally relevant. The situations she describes could just as well happen in Paris or New York instead of Melbourne and Adelaide. The same fragrance products are sold worldwide and the industry is multinational. Much of the research she cites comes from the United States. Since Grenville is so famous in Australia, her book was mentioned by their mainstream press (other books on similar topics were completely ignored). In The Australian a self-professed lover of perfume was given the task of reviewing the book. She did so under the title �faint scent of overkill in war on perfume� and dismisses the book and its data as �reaching only the kind of people who insist on organic food� and states that �vulgarity� is a much more pressing problem. She appears as attached to her fragrances as people are to cigarettes, and as deaf to reason. In an interview with The Guardian Australia, Grenville reports that the book has had an effect on her fans. On her 2017 book tour she noticed when she spoke in front of groups that the air quality was much better than on her 2015 tour. The book is also available in the United States, but has been completely ignored by the press, presumably because Kate Grenville is not famous here.